SANTA CLARA – Each day in the United States, three children die and five others are hospitalized, often with serious or fatal health complications, as a result of drowning. But many of these tragedies are preventable with awareness, supervision and preparation. One way parents can help protect their young children from drowning is Infant Swimming Resource, a unique system of survival techniques designed to keep kids afloat until help arrives. “Open water is very dangerous to children who don’t know how to swim or stay afloat. It takes only a few moments for a fatal situation to occur,” pediatrician Martin Nygaard, who practices at Intermountain Sunset Clinic, said. Drownings are the leading cause of accidental death for children ages 1-4 and the second-leading cause of accidental death for all children under age 14. Of the children who are hospitalized following a drowning, 15 percent die in the hospital and about 20 percent suffer severe and permanent neurological disabilities. An overwhelming majority of drowning victims lack the ability to swim. 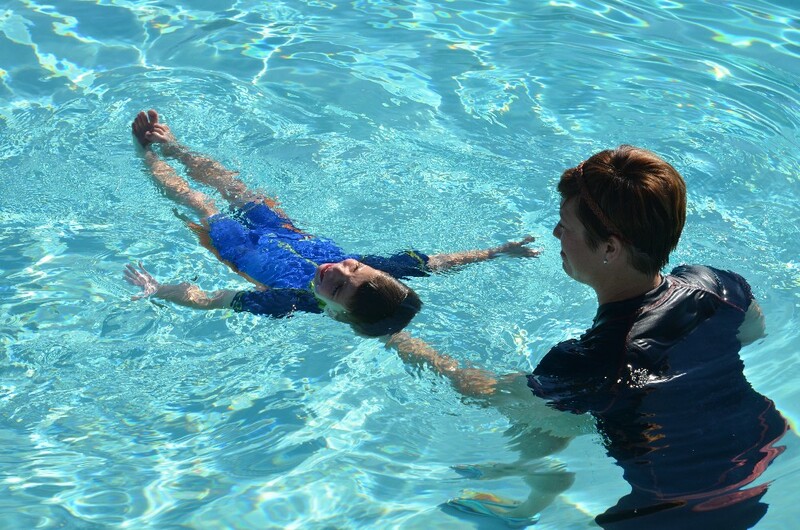 Participation in swimming lessons greatly reduces a child’s chances of drowning. Drownings can happen anywhere there is water, from lakes and pools to bathtubs and even buckets. It only takes minutes for a drowning to be fatal. Of child drowning victims, 75 percent are left unsupervised for only five minutes or less. Children under age 14 should ALWAYS be supervised by a responsible adult near open water. The roots of Infant Swimming Resource, also called Infant Swim, trace back to 1966 when 18-year-old lifeguard Harvey Barnett witnessed the aftermath of the drowning of his neighbor’s child. The tragic event inspired Barnett to begin teaching young children to swim. His observation of how they responded to certain types of communication and instruction techniques, even nonverbal infants, was the catalyst for 45 years of research and the eventual creation of the Infant Swim program, backed by behavioral science and childhood development principles. Going beyond traditional swim instruction, Infant Swim’s self-rescue training teaches children as young as 6 months old how to survive alone in open water. Aside from basic swimming techniques, kids learn to hold their breath underwater, swim with their eyes open, float on their back to rest, keep their nose and mouth above water, crawl out of a pool and most importantly, stay calm. These methods can be taught to very young children because they are motor skills learned through repetition and sense, not verbal instruction. Lessons typically last just 10 minutes and are given five days a week for four to six weeks. Children practice skills individually tailored to meet their abilities and needs with their instructors one-on-one. After completing the program, kids are expected to be able to swim safely and independently. More than 260,000 children have participated in Infant Swim lessons taught by 450 instructors in nine countries, resulting in some 800 cases of kids using the program’s techniques to save themselves from drowning. 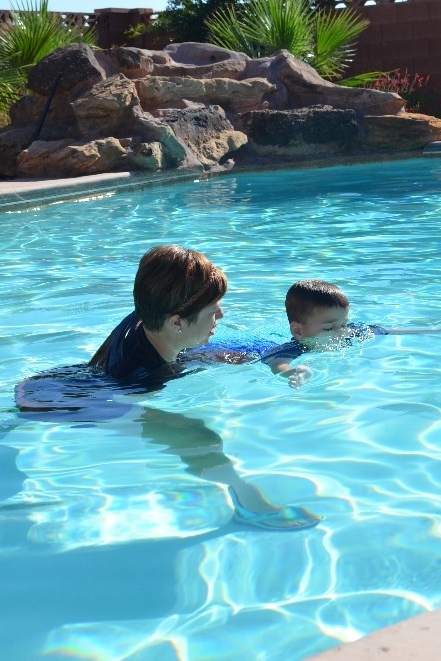 Despite this widespread success, there is only one certified Infant Swim instructor in all of Utah, Santa Clara’s Robyn Lamoreaux. A wife and mother of five, Lamoreaux found that traditional swimming instructors in the area were willing but untrained in working with children under age 3. She believed that with the many swimming pools and local families who use them, a comprehensive swimming instruction program for all children, but especially toddlers and infants, was a much-needed service for the community, and became involved with Infant Swim. Andrea Reid enrolled her 3-year-old son Finn in hopes of gaining some peace of mind. After two weeks with Lamoreaux, Finn is already more confident in the water. He has learned that when he needs to rest, he can flip on his back and float, then make his way to the pool’s edge and hold on until help arrives, Reid said. Dylan and Lisa Christensen’s 7-year-old son Carson has suffered from an intense fear of water all his young life, which a variety of other swim instruction techniques were unable to assuage. But that changed once he started Infant Swim. In just two weeks, he has learned “real” swimming for the first time, along with basic flotation and water survival skills. Lamoreaux works with children from infancy to age 10. Being an Infant Swim teacher, she said, is a challenging yet rewarding job. Each instructor completes a six-week intensive training and certification program, which includes a minimum of 60 hours of supervised in-water training and education and testing on subjects such as child psychology, physiology and behavioral science. Once an instructor is certified, they must undergo annual reviews and re-certification to ensure skills and techniques continue to meet the program’s standards. For more information on Infant Swim, contact Lamoreaux at 435-229-7737 or r.lamoreaux@infantswim.com. While Infant Swim and like programs are proven effective in enhancing a child’s safety, they are not a preventative guarantee and should never be treated as a replacement for responsible adult supervision while children are in or near water. “Vigilance is what protects our kids, more than anything. Supervision is necessary even for children who have learned swimming skills,” Nygaard said. There are many steps parents can take to ensure their child is as protected from the risk of drowning as possible, beginning with education. The CDC and KidsHealth each offer insightful safety tips. “There is nothing more important than the safety of our kids,” Christensen said.